What pain can be considered chronic? Specialists answer that if the pain is still present after three months, notwithstanding the appropriate treatments, such pain can be considered chronic. Chronic Pain is often experienced by victims of Motor Vehicle Accidents, Slip & Fall Accidents, or other accidents in the form of a sharp or nagging pain. Chronic Pain dramatically lowers the quality of life of the person who is experiencing it. The individual cannot work, rest, and enjoy the life as he or she was accustomed to before the accident. Most often Chronic Pain starts after neck, back, head injuries, and injuries of musculoskeletal system. 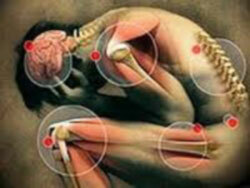 Chronic Pain can result in depression and other psychological disorders. The treatment of Chronic Pain must be undertaken by a specialist who knows how to cope with pain, including psychological methods. If you, your relatives, or your friends suffer from a Chronic Pain as a result of an accident, urgently call SLOMYANSKI LAW at 416-519-1006, or send a fax to 647-340-2899, or complete the form on our website in order to get a free consultation. You pay only after you receive compensation.